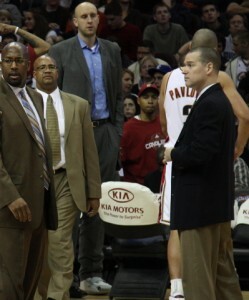 The left ankle injury that Zydrunas Ilgauskas suffered versus Philadelphia on December 10 when he landed on former Cav Donyell Marshallâ€™s foot was originally diagnosed as a sprain but further tests have revealed that he actually has a small fracture in the talus bone. The good news is that overall his footâ€”which had to be reconstructed with pins and screws earlier in his careerâ€”is solid structurally but the bad news is that he is expected to be out of action for three to four weeks. Assuming that the Cavs will be conservative in light of his previous injury history and that they most likely would bring him back in a home game, if there are not further complications then perhaps Ilgauskas will return versus Toronto on February 3. If that is the case, then he will miss 14 games (in addition to the four games that he has already sat out, three right after the injury happened plus Fridayâ€™s 117-92 win over Chicago). What impact will this have on the Cavaliers? Donâ€™t be misled by Clevelandâ€™s 3-1 record without Ilgauskas this season; all three of those victories came against sub-.500 teams and, in any case, it is much more difficult to survive without a key rotation player for several weeks than it is to do so for a handful of games. Also, do not be fooled by the fact that the Cavs went 5-1 from December 19-30 while playing with a clearly hobbled Ilgauskas; not only were two of those wins versus Oklahoma City and Washington but even though Ilgauskas was obviously struggling he still played his regular minutes, which meant that there were no disruptions to the normal player rotation. Now, Anderson Varejao will move to the starting lineup and the Cavs will either have to increase the minutes played by Varejao and/or Ben Wallace or else rely more heavily on players who have been playing fewer than 10 mpg (J.J. Hickson, Darnell Jackson and Lorenzen Wright). It is also possible that in certain matchups Coach Mike Brown will go â€œsmallâ€ and put LeBron James at power forward, though I use the term â€œsmallâ€ advisedly since James is essentially the same size that Karl Malone was during his prime. When a starting player for a good team goes down in the NBA the problem is not just with replacing him but also with replacing his replacement; Varejao can be an effective starting center in a pinch but who among the bench players will fill Varejaoâ€™s old role? Prior to Ilgauskasâ€™ injury, the Cavs employed one of the best rotations of three â€œbigsâ€ in the NBA; fansâ€”and even some commentatorsâ€”do not seem to fully appreciate just how effective Ilgauskas, Varejao and Wallace have been this season, particularly in terms of defense and rebounding. They each average between 25 and 26 mpg and they each average exactly 7.1 rpg. The individual numbers are not eye-popping only because of how evenly the minutes are distributed; each of the big men is averaging around 10 rpg per 36 minutes and that is why Cleveland ranks third in the NBA in rebounding differential. 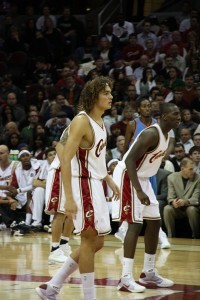 Wallace (1.7 bpg) and Ilgauskas (1.3 bpg) are Clevelandâ€™s primary shotblockers, while Varejao is a tenacious and versatile defender who draws charges and frustrates opponents with his physicality and high energy. With those three players shutting down the paint, the Cavs rank first in point differential, first in points allowed, second in defensive field goal percentage and fourth in blocked shots. Having three big guys who are so good at protecting the paint enables the perimeter defenders to aggressively go for steals because they know that the help defense behind them is so solid; the Cavs rank seventh in steals. The long armed, 7-3 Ilgauskas is the only legit seven footer on the roster and the Cavs will miss that size and length at both ends of the court; in addition to his defensive contributions, Ilgauskas is a very good offensive rebounder and he is the teamâ€™s best low post scoring threat. Unlike Varejao and Wallace, Ilgauskas is also a deadly outside shooter who can spread the court after running a screen/roll action with LeBron James or Mo Williams. Ilgauskasâ€™ absence during the next month or so could have critical playoff implications because the Cavs are not only battling the Boston Celtics for the best record in the Eastern Conference but they also only have a slim lead over the Orlando Magic for the third seed. Last season, the Celtics demonstrated the value of home court advantage during their title run; the L.A. Lakers have openly spoken about wanting to have the best record in the league this season and that is also a goal that the Cavs should have in mind. Nine of Clevelandâ€™s next 14 games are on the roadâ€”including visits to the Magic and the West-leading Lakersâ€”so this promised to be a tough stretch for the Cavs even if they had been at full strength. The Cavs only lost five of their first 32 games but it is very possible that they will add five more losses to that total before Ilgauskas returns. One possible silver lining in this situation is that if the Cavs manage to stay ahead of Orlando and in contact with Boston then the extra minutes played by young Hickson could help prepare him to be a contributor down the stretch of the season and during the playoffs. On the other hand, an injury now to Varejao or Wallace would really be damaging to the Cavs.